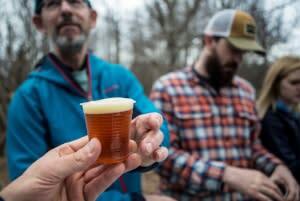 Breweries will bring their hops to the snow at several tasting stations along the trails, pouring samples as skiers and snow showers gather and mingle at fire pits along the way. The event has grown to include the following North Country and Adirondack breweries: Big Tupper Brewing, Raquette River Brewing, Valcour Brewing Company, Township 7 Brewing Company, Oval Brewing, Lake Placid Pub & Brewery, Big Slide Brewery and Public House and High Peaks Distribution, which is bringing Livingood&apos;s Restaurant and Brewery, and Saranac Beer. MAC’s safe ride will be operating from 12-3 p.m. to provide transportation to participants. The event is Saturday, February 24 from 1-4 p.m. at 141 Country Club Road, Tupper Lake. The beer trail pass is $10 per person. Please bring a photo ID. Also happening simultaneously is the Fire & Ice Golf Tournament from 12-4 p.m on the golf course. Three person teams will play the five-hole course twice. The cost is $60 per team with the proceeds to benefit the Lion’s Club community projects.